Get your camera ready. China Tang’s first location in America raises the bar for culinary showmanship. 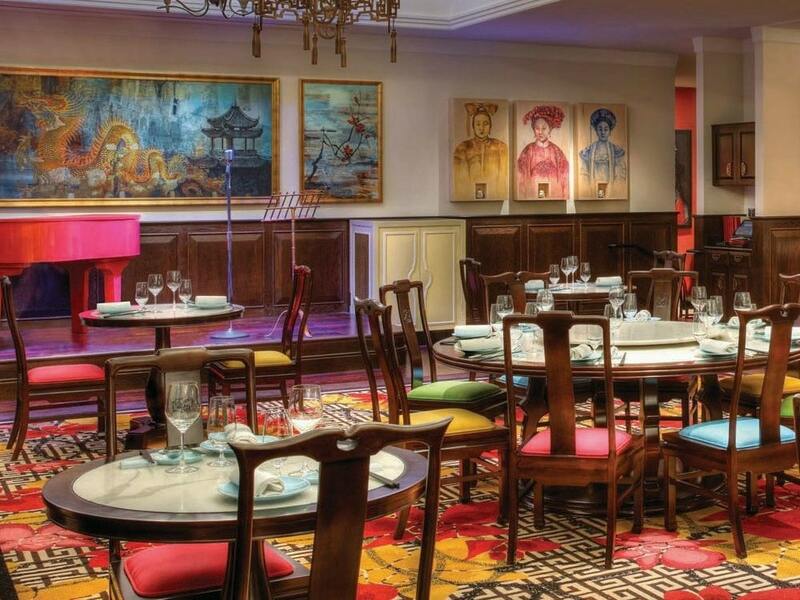 International travelers and discerning diners are no strangers to the name China Tang, the iconic art deco haven that has been bringing A-listers to London’s Dorchester Hotel for nearly a decade. Hongkongers may especially be familiar with the luxurious China Tang Landmark, the first China Tang in Asia, which opened its doors to critical acclaim. Now, the Hong Kong-based Lai Sun Group—which owns and operates a portfolio of luxury restaurants including China Tang Landmark—officially makes its Western Hemisphere debut with China Tang Las Vegas, now open in The District at MGM Grand. Both versions of the menu—English and Chinese that display the prices in USD and Hong Kong currency—are overseen by the Lai Sun Group’s executive chef Albert Au Kwok Keung, the world’s youngest chef to helm a three-Michelin-starred restaurant, The Eight, in Macau. Here in Vegas, executive chef Larry Ng was plucked from the Hong Kong Jockey Club to ensure the cuisine is up to par. “The barbecue pork is one of the signature dishes,” he recommends. Another signature dish worth ordering is the Beijing roasted duck, which takes more than 24 hours to prepare before it is roasted in an imported oven. The duck is artfully carved tableside and divided to create three mouthwatering courses. We recommend the duck along with the braised rice with Australian wagyu beef, black truffle and wild mushrooms in a clay pot, for a flavor explosion. The extensive dim sum selection is also a must. Traditional sui mai and steamed shrimp dumplings are no-brainers for the less adventurous, but the xiao long bao, a soup dumpling filled with broth and pork served with a tangy black vinegar sauce, is over-the-top. Those yearning for a spectacle should order the hammer chicken, the closest thing to Chinese comfort food. The full bird is stuffed with mushrooms and pork belly before it is wrapped in a dried lotus leaf. It is then covered in wet clay and baked for five hours before being doused with rosé at the table and lit on fire. Finally, one guest is presented with a mallet with which to hammer the chicken to break the clay. The $108 price tag and 60-minute preparation time are worth the wait. The China Tang experience doesn’t stop at the food. The cocktail menu transports guests to pre-Opium War-era China with a mix of American and Asian flavors, served in an extraordinarily distinctive fashion—such as the Yu Gardens, a cold cocktail that is presented in a Chinese tea pot that simulates steam through dry ice piping out of the spout. “We put a lot of work into the cocktail program and hope that it rivals the food,” adds Dumonet. We recommend the Mr. Tang, a dreamy blend of Rémy Martin XO cognac, Cointreau noir liqueur and absinthe, served atop a smoking jewel box. For added drama and cultural immersion, there are noodle-pulling shows several times a night, and a singer who sings in Chinese. Whether you come for cocktails or stay for a full meal, China Tang puts you in the front row of the Strip’s most exciting culinary show, hands down.